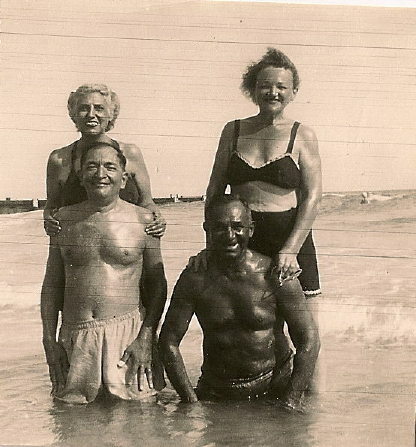 Here's a photograph of my four paternal great-grandparents, on a vacation together. They were good friends prior to their children getting married. Barney and Bertha (Cruvant) Newmark are on the left, and Herman and Annie (Blatt) Feinstein are on the right. 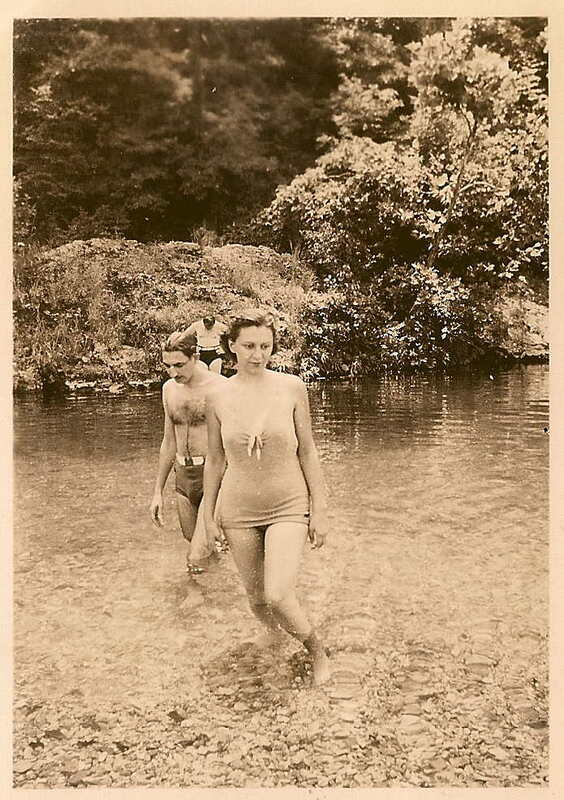 The year was 1947, they were in Miami, FL, and family lore states that while the Feinstein surname caused them enough difficulties with the area hotels in that year, as the vacation progressed, and my great grandfather's tan grew darker and darker, their difficulties are said to have grown. Here's some photographs of the children of the above four, ten years earlier in 1937. My paternal grandparents Melvin and Sissie (Feinstein) Newmark. They are on their honeymoon in the Lake of the Ozarks, Missouri. 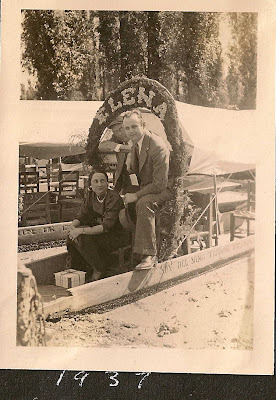 Here are my maternal grandparents, also on their honeymoon in 1937. Martin and Myrtle (Van Every) Deutsch. 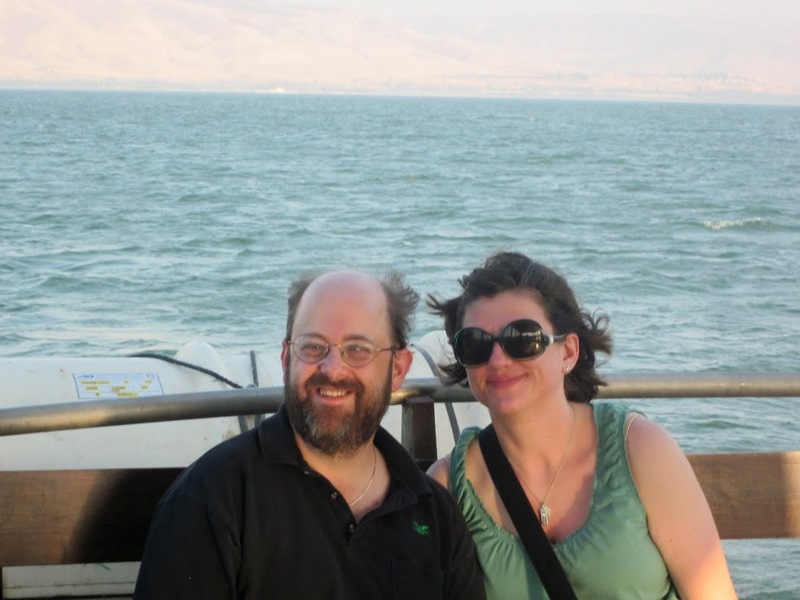 The water isn't visible in this photograph, though it is clear they are on a boat. They are in Mexico. The beginning of the phrase on the boat reads: "Soy del nino" which translates to "I am the child." I can't read the rest. 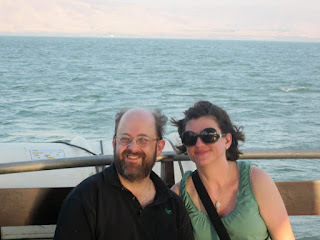 And finally, here is a photograph of my wife and me last year, on our honeymoon. Goodness me that is VERY brown. I tan quite dark, but I've never been that dark. Nice photos - thanks for sharing. I bet they were so happy when their children married. That is some tan! The women sure tower over the men in the first photo! It appears they are all in very shallow water, and the men are kneeling. What a wonderful collection of fun in the sun and water! Always a good mix! Fun to have so many family members enjoying water. A nice theme running through a families history. That's quite something getting all four paternal great grandparents together on holiday, as well as in a photograph. You get such a sense of history from photos such as these. Somehow you could not reproduce them now, it is something about the shapes, the looks, the expressions. It's amazing how many old family photographs we all have of family posing in or near the water somewhere! And yes, your great-grandfather really did tan! 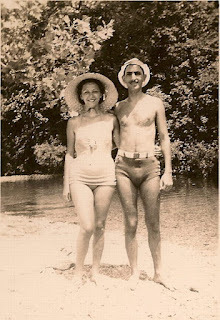 My mother-in-law, supposedly of Indian descent, was from Nassau Bahamas and and married a nice Trenton, NJ boy in 1949. They settled in Miami, FL and produced 7 children with varying complexions. My own husband also tans very easily & quickly. I had a good chuckle seeing Herman "baked" like that!! Not something you see as much these days. A change in mentalities, what with skin cancer. A healthy glow is one thing, but that?!? Too much!!! But as long as they all had fun, who cares, right?! ?